1. Selectable print mode to suit the production (from high-speed to high-quality) New! For the realization of higher quality of print, 1,200 dpi print mode is added and the multi-pass is applied. Tiger-1800B MkII will apply the production from the high-speed print regarding much importance for productivity to the high-quality print of beautiful image. Maximum print speeds of up to 385 m2/h (*) in high-speed mode. In 1 pass mode all printheads are used. One print width is equivalent to two staggers, and printing at high speed is possible. 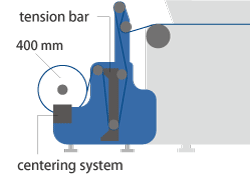 Multi-pass means to print a determined printing area by multiple times with different nozzles, which allows to suppress the cause of stripe and band and create a beautiful print. 2. Mimaki Advanced Pass System (MAPS) delivers stable high-quality printing New! In general, the boundary of pass to be a line is more likely to become the cause of bandings or color shading by just a small gap while printing. The MAPS (Mimaki Advanced Pass System) can realize the beautiful printing with less banding and color-shifting by spreading the edge of pass and making the boundary as gradation. Banding is found at the boundary of pass. Stripes and color-shifting are degrading the image quality significantly. Ideal for fine design data such as thin lines and for light colors printing. Ideal for printing where density is required such as monochromatic colors. 4. 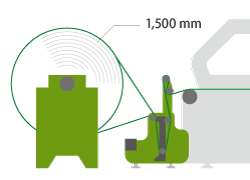 Nozzle recovery system (NRS): Consecutive operating solution to maintains the productivity New! Nozzle problem which is not solved even if cleaning causes the production stop due to machine's downtime till the completing of repair by service staff. 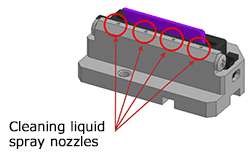 NRS (Nozzle Recovery System) is mounted as when a problem occurs in some nozzles, other nozzles will take place to continue to print. Without the operation stop to wait the arrival of service staff, the productivity can be maintained. * NRS is to be applied from December 2018. NRS may not be activated depending on print modes. Textile transport security is achieved by the twin pressure roller shafts attached to the edge of the transportation belt. Textiles are uniformly applied without wrinkling onto the belt through the upper and lower rollers (Fig. 1), assuring stable textile transportation. 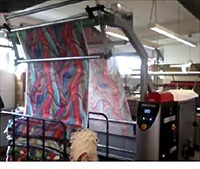 Furthermore, the wrinkle and jam sensors detect textile wrinkling or creasing early in order to minimize potential damage to the printheads from collisions with raised or jammed textiles. Air bubbles generated in the ink can lead to missing nozzles because such bubbles act as cushions that decrease ink ejection power. To assure stable ink-jetting, each model of the Pro　series has a degassing module that removes bubbles and constantly circulates ink. Cleaning liquid is automatically applied to each wiper before and after head cleaning. This liquid enhances the cleaning effect during the head-cleaning process, ensuring a clean wiper and reducing daily maintenance time. Furthermore, as each printhead has its own wiper, quick and effective cleaning is enabled while color mixing in the printheads is avoided. Optimal introduction is available to suit the production process of customers. Feeding unit for roll media equipped with centering device and tension bar. This unit is used for feeding large-sized, long-rolled media. Jumbo roll feeding unit for setting a long length transfer paper. 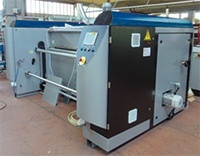 This unit can dry special and high density printed fabric. It is effective also for wool and the like which is difficult to dry. * The standard size heating unit that comes with "Tiger" main unit is not needed when purchasing a large heating unit. Pleating feeder unit without winding the fabric after dry. Feeding the printed fabric after drying while pleating into receiving box. It can be used with both standard and large heating units. 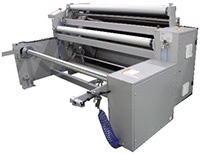 Jumbo roll drying/winding unit for setting a long length sublimation transfer paper. 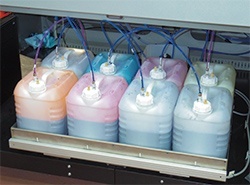 The bulk ink supply delivers cost-effective printing and enables long-hour printing. Furthermore, the printer monitors the ink level using a weight detection sensor and displays an alert on the operation panel when the ink level is low. High-performance software RIP "TxLink3 Standard" is bundled.